The Life of Bon: Hi dad. Yesterday marked six years since my dad left us for what I believe is a better world. I didn't get a post out because the black plague has struck our house. Finally this morning my two sickies were sleeping, and I felt well enough to crank out some words about my dad. Well, it was supposed to be about him, and then it kind of ended up being to him. And so it goes. I wish you were here. I wish you would take me to Crown burger again with Mary, and we could tell you about our college exams and the stupid boys we were dating and I wish you could try to figure out that silly camcorder and that “I got a feeling, tonight’s gonna be a good good night” could come on the radio again and Mary could say, “Dad, this is one of the most popular songs right now”. I wish you would ask me when the last time I changed the oil in my car was and am I studying hard enough and please don’t stay out too late with the boys, Bopper. So much has changed since you’ve been gone. Since the last time I saw you I graduated from college, got my first job, met and married my husband, started a blog that even strangers read, moved a bajillion times, had a baby girl. I grew up since I last saw you. I am a different person, but I think I am a better person than the Bonnie six years ago. I sometimes wonder if you are proud of the person I am today and I think you are. I try to be stronger and I try to be softer. I try to be kinder and I try to be more stern. I try to laugh more, and I know I cry more. I miss you every day. The missing now is different than the missing right after you left us. Then it was blinding and aching and all encompassing. Now it is a dull pain that comes on suddenly and sharply in moments when I least expect it. A wish to tell you something. To call you. To ask your advice. To have you hug me. It is an absence that never goes away. Sometimes I wish so bad that I could see you with June. I know all babies are more or less the same, but not to a grandpa, they aren’t. I wish I could see her crawl into your lap and I wish I could see you playing peek a boo with her and I wish you could hear the way she giggles. I think you’d tell me that she looks like me or that she is such a petite little babe, and I think seeing you with her would make me feel so connected to both of you. My past and my future. I think you know this, but just in case you don't, I'll tell you that June has a dad that adores her in the same way you adored me. I don't feel like I'm doing everything right in this life, but I did get that part right. I look at them playing together, and I think she's so lucky to have him just like I was so lucky to have you. It's one of the best things I'll ever be able to give June. A dad like mine. I wonder what you would think of the world we live in today. It seems so different than the world we lived in together six years ago. It seems harder and more confusing and more sad. I wish you were here to help me navigate it. It seems like people are less patient and less forgiving than they used to be. Less caring about the plight of others. You always had such a strong sense of “the way things ought to be.” I try to think of the way you would see do things and follow that. ­Thanks for encouraging me to be such a strong woman. I never realized it, but you were the one who first taught me about feminism. Thank you for telling me I needed to get an education and not to date until I was 25. Thanks for telling me I could be a doctor or lawyer or a teacher or a nurse or anything I wanted to be. Thanks for telling me I was smart enough to go to any college I wanted to. Thanks for telling me those boys weren’t worth it who made me sad in high school and that what they thought of me didn't have to define me. Thanks for coaching me on spelling bee words and taking me to the cabin to work so many weekends. Right now are you in heaven playing with my future babies? I like to think that. Will you keep them safe and happy for me until it's time for them to come join me? They don't get to know their grandpa in this life, but maybe they get to know him before this life. 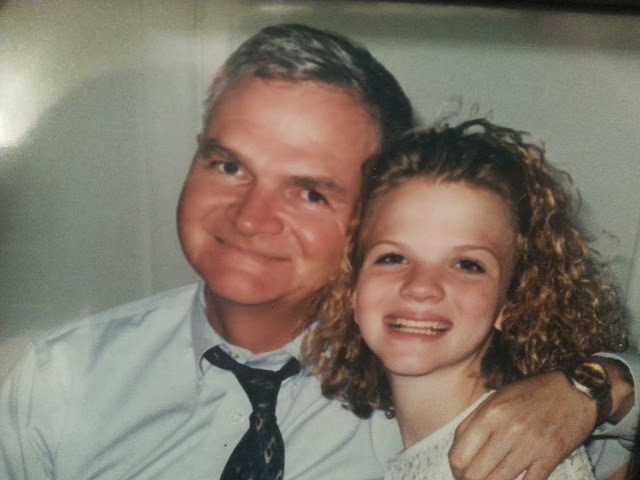 I miss you every day, dad, and I never stop loving you. P.S. Do you get to watch baseball games in heaven? this one, about the day I found out I was pregnant with June. I know you love tv. How would I live without June? Lost Instruction Time: What Does Your School Do? What are we going to do about daylight savings?